Mario is based in San Antonio, TX. 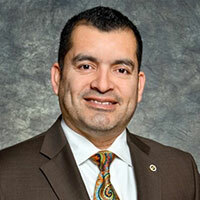 In his role, Mario is responsible for maintaining contacts and engaging with city, county, state, and federal government officials and agencies to foster dialogue on issues related to Toyota. Additionally, Mr. Lozoya directs the Regional Community Engagement Strategy to include Philanthropy and Media Relations. Mario is often engaged at the State and Federal level on issues related to Education and Workforce Development and has been instrumental in changes to state policy related to this space. Mario is a retired U.S. Marine, having served 23 years of active duty. He is a Naval Justice School graduate from San Diego, CA and served as a Command Legal Officer. He also served, in different years, as a Curriculum Developer, Information Systems Specialist, and Aviation Logistics & International Supply Chain Chief. He is a decorated combat veteran of the Iraqi War and has completed long term deployments in South Korea, Japan, and the Middle East.